38" x 20" x 48.5"
Finished in Aged Charcoal Gray, this metal cabinet features a solid wood top with a weathered finish. Finished on all sides, this cabinet includes metal wheels for mobility and can be located in any part of a room. 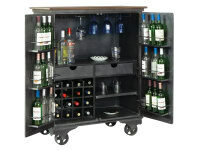 The two hinged doors feature six fixed shelves on the inside for convenient liquor storage. The console interior houses a long fixed shelf, below a hanging metal stemware rack, for storing large items such as trays. The lower storage area also includes a smaller fixed shelf. Two drawers offer ample storage for accessories. A removable metal wine bottle rack offers storage for up to 16 bottles. (W x D x H): 38" x 20" x 48.5"